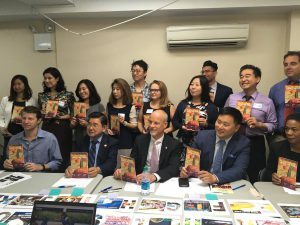 AAFE and the Flushing Chamber of Commerce unveiled a brand new website Sept. 21 as part of a comprehensive campaign to promote Flushing’s small business community. 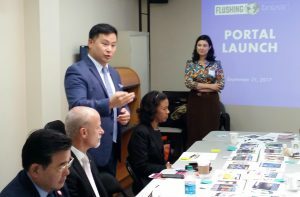 The two organizations, in partnership with the NYC Department of Small Business Services, launched Flushing Fantastic (FlushingFantastic.nyc), a site designed in coordination with the local community. As New York City’s fourth largest commercial district, Flushing is teeming with activity. The new portal will help visitors navigate this diverse and vibrant community and connect with hundreds of small businesses, cultural venues, restaurants, hotels and historic landmarks. Flushing Fantastic was launched Sept. 21. 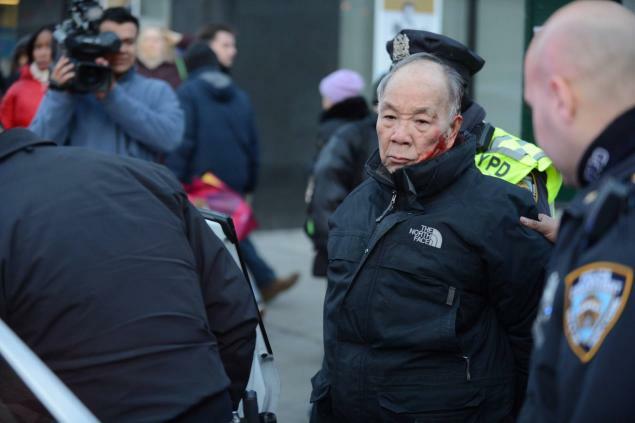 Photo by Benjamin Fang, Queens Ledger (via Twitter). Users of Flushing Fantastic will see the area through the eyes of local residents. The website offers visitors an easy way to plan trips to Flushing by providing transportation options, an event calendar, maps, and recommendations for tours and and fun things to do. It also provides a directory of local accommodations, restaurants and shopping centers. The Flushing Fantastic autumn campaign highlights the many festivals and events taking place this autumn and winter – from the Harvest Fest and Pumpkin Patch to Open House New York, the Diwali Festival of Lights, NEA Jazz Masters: Celebrating 100 Years of Dizzy and Monk, Great Northeast Cheese & Dairy Fest and the 30thAnnual Holiday Historic House Tour. The site’s content is aimed to evoke a sense of discovery and get the word out about the cultural diversity and exciting programming taking place in the neighborhood. It highlights Flushing as an exciting destination for the bold adventurer. “When people visit New York City, they generally see Times Square, the Empire State Building and Central Park, but, while these sites are great to see, they represent a fraction of what New York has to offer. In Flushing there is so much to see and do for both locals and visitors. 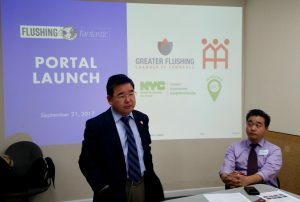 Now, with the new Flushing destination portal, anyone can navigate this diverse community and truly experience what Queens and New York City are all about,” said State Sen. Toby Ann Stavisky. The public is invited to share comments, feedback, and their ideas on the Flushing Fantastic website by getting in touch with the Chamber. As visitors explore the neighborhood, they are encouraged to share their experiences through Instagram and other social media platforms using #MyFlushing hashtag. Visitors can also receive the Flushing Fantastic newsletter through email by texting MYFLUSHING to 22828. 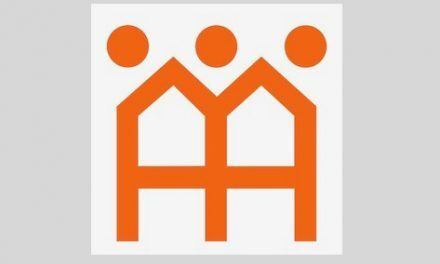 The campaign is part of the Department of Small Business Services’ Neighborhood 360° Program. The city provided a $1.55 million grant to support commerce in Downtown Flushing through partnerships with local businesses and city agencies. 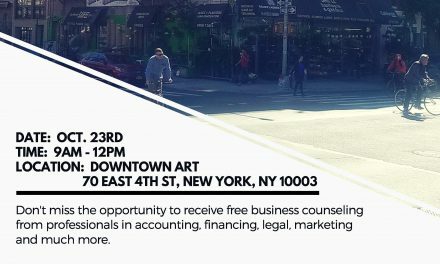 The Neighborhood 360° Program was created by the NYC Department of Small Business Services to identify, develop, and launch commercial revitalization projects in partnership with local stakeholders. Steering Committee members for Neighborhood 360° in Flushing include: Queens Borough President Melinda Katz, NYS Senator Toby Ann Stavisky, NYS Assemblymember Ron Kim, NYC Councilman Peter Koo, NYC Department of Small Business Services, Queens Tourism Council, Asian Americans for Equality, Greater Flushing Chamber of Commerce, Downtown Flushing Transit Hub Business Improvement District, Flushing Chinese Business Association, Flushing YMCA, Flushing Community Library, NAACP Northeast Branch in Queens, and Sheraton LaGuardia East Hotel.